Maccaferri US provided their renowned gabion products in a recent project developed at the Courtyard Marriott Hotel in Wayne, New Jersey. As part of the renovation works, an additional gabion wall was recently added to a 10-year-old existing one. The Hotel is being remodeled with the deployment of a number of extensions. Since additional parking spaces are going to be needed, among the renewal works a new gabion wall was added in order to support an existing retaining wall. 1500 square/yards of MacTex N 47.1 non-woven geotextiles. 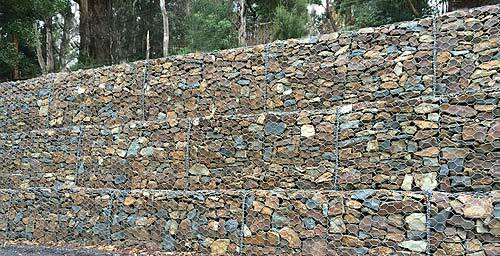 As is common knowledge, Maccaferri is the undisputed world leader in the manufacturing of gabion baskets, engineered from double twisted hexagonal woven steel wire mesh, while our Spenax fixing rings are used to assemble them. Their applications range from retaining walls and soil reinforcement to their deployment in landscape and architecture projects. Maccaferri’s Mactex N series are high quality non-woven geotextiles manufactured from virgin high tenacity polypropylene fibers assembled by a needle-punched treatment only. To learn more about Maccaferri’s gabion and geotextile products please feel free to contact us.